As Springtime slowly creeps up to the Adirondack North Country, the entire region is awakening to the possibilities and opportunities that lie ahead. Our region’s economy thrives during the warmer months as businesses, shops and restaurants extend their hours and stock their shelves to best accommodate our region’s residents and visitors. We’re all gearing up for a summer season bustling with social and economic activity in our towns and villages. Small businesses play a major role in our local communities. They create. They serve. They fix. They nurture. They teach. They inspire. A 2015 report by the Office of Advocacy of the U.S. Small Business Administration (SBA) describes how important small businesses are to New York State’s economy. Keeping in mind that the report’s definition of “small business” is a firm with fewer than 500 employees, the federal analysis notes that small businesses make up over 99% of employers and account for over two million businesses statewide. When we break it down further, we see that 51% of New York’s small businesses employ between one and 100 people and nearly 20% employ fewer than 20 people. Additionally, there are over 1.6 million self-employed small business owners who do not employ hired help. So how does the North Country measure up in its contribution of small business activity within New York State? The comptroller’s report demonstrates how most of the region’s small businesses employ fewer than 20 workers and that businesses with fewer than 100 employees are responsible for well over half of all business payrolls and receipts in the North Country region. This data shows how important North Country small businesses are in terms of employment, payroll and receipts. They are the foundation of our economy. ANCA works with small businesses in a variety of ways in order to bolster a vibrant and resilient economic landscape in the Adirondack North Country. Among our small business members and partners are the artists and makers who participate in the Adirondack Buyer Days trade show. On March 27-28, ANCA hosted its 31st annual Buyer Days show in Saratoga Springs, NY. This wholesale gift show attracts artists and entrepreneurs who own and operate small businesses all over the region. 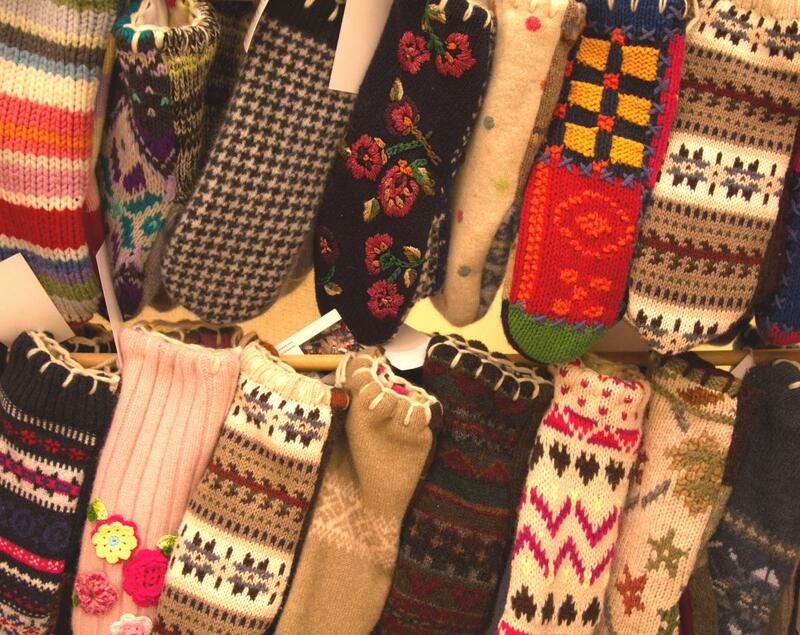 This year, over 80 artisans exhibited at the show. Some of these businesses are as small as you can get, where the artisan manages all of the business operations from production to marketing and sales. Others have expanded enough to hire part-time and full-time employees. Above: Adam Cresko of Roosevelt Grooming Company speaks with buyer Aubra Herman of New York Makers at the 2017 Adirondack Buyer Days show in Saratoga Springs, NY. 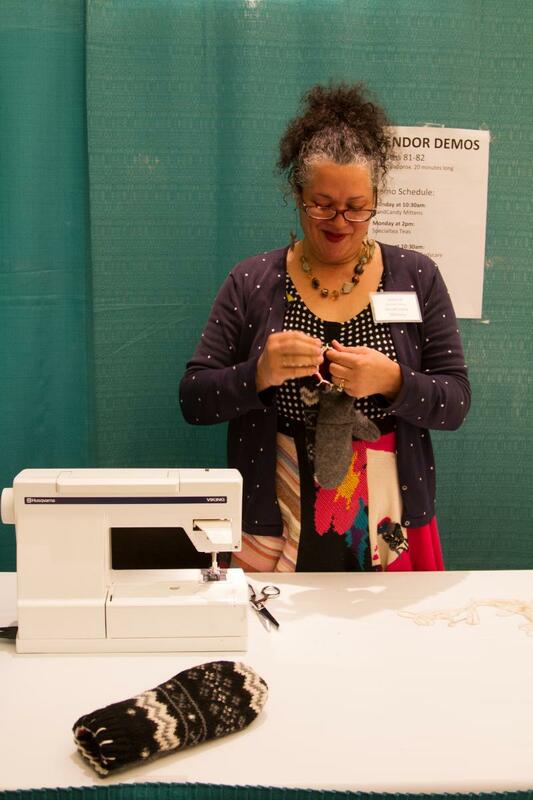 Above: Charlotte Besaw, owner of HandCandy Mittens, demonstrates how she makes mittens from upcycled materials at the 2017 Adirondack Buyer Days show. ANCA is proud of our tradition of connecting small business owners with new markets. Beyond Buyer Days and other programs that support local artisans, we also serve small businesses through our continued work with small farms, makerspaces, independently owned businesses that are featured in the North Guide, and community development groups who work to revitalize downtowns, promote tourism and attract new entrepreneurs. We believe that by supporting small businesses throughout the region, the economic and social benefits will be far-reaching and long-lasting. Particularly in rural regions like Northern New York, an economy populated by a variety of small businesses can be more stable and more resilient than one dominated by very few large firms. 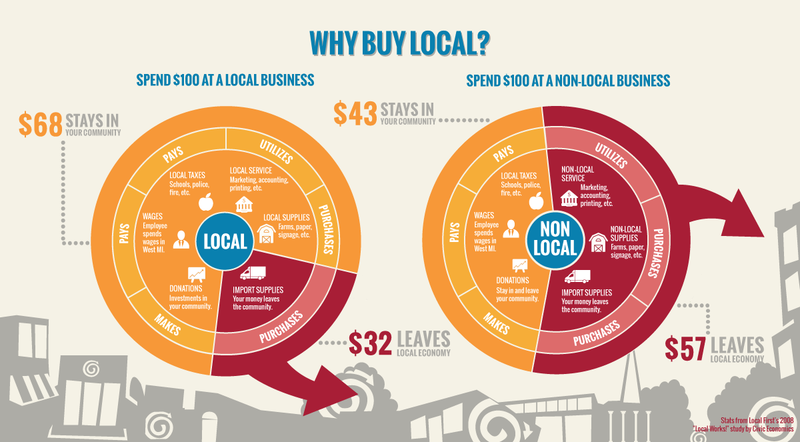 The infographic below depicts how supporting our local businesses has immediate economic benefits in our communities. Small businesses keep dollars in their local economies through multiple avenues: workers’ wages, local taxes, charitable donations, as well as the purchase of local supplies and services. As the warmer weather approaches, we are looking forward to a prosperous and progressive season for small businesses throughout the North Country. These entrepreneurs -- and the hard work and creativity they bring to their businesses -- are integral to the economic vitality of the region.